Discussion in 'Skab Leatherworks and Forge' started by Skab, Sep 18, 2015. This one is for a rendezvous buddy's friend. I didn't have the knife, but a tracing of the blade to make a pattern for it..... But he wanted a little quill work, half white and the other black. 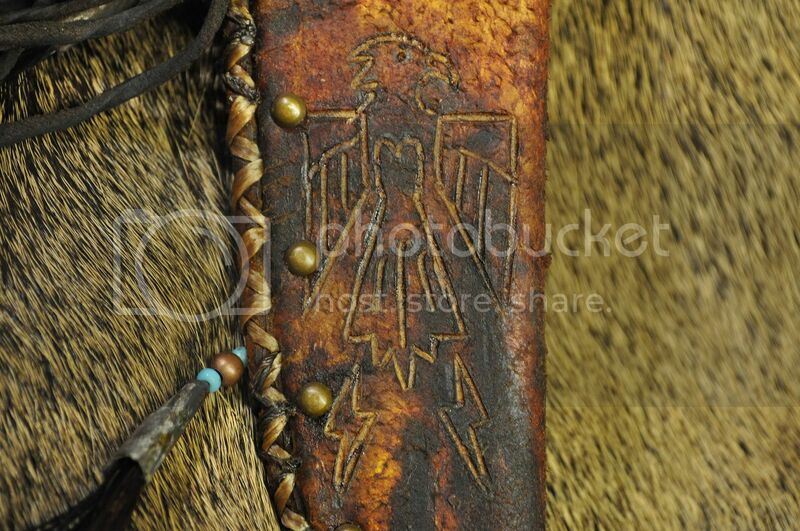 He also asked for a thunderbird to be put on it, so I burned one in the front and then he sent some hair for his deceased horse to be used on the sheath, so made some copper cones and included a couple beads as well. Caveman Cracker, Bryan King, wvtracker14 and 20 others like this. Excellent piece of work. All the ones I've made don't come anywhere near to that. I like the "naturalness" (new word) of it. Very nice, let's keep something like that in mind for my next one. Really great work, again. I've said it before, but when I can I'll have one made. I'm sorry for going against the flow, I don't care much for that style of sheath. Theres too much going on with all the fringe and Native American motif. I don't own a knife worthy of that sheath, I'm too basic and simple, sorry. 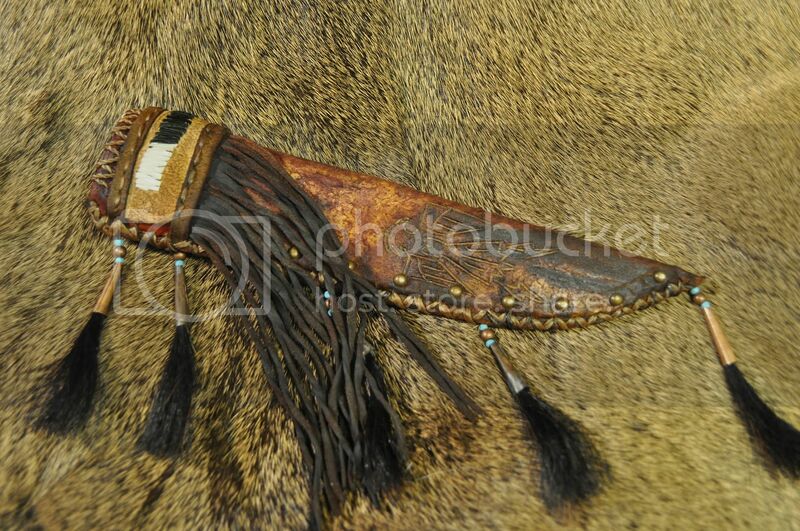 An obsidian blade or something more primitive would be more appropriately matched with this style of sheath IMO. Still, it is a work of art...just not for me. Please accept my opinion....thanx for sharing! Good thing it's not your sheath. Stringer, Leshy, perrito and 1 other person like this. I'm with the majority here. I think it's a beauty. Do/Can you make or point me to Stachel carry my knife. I’ve looked and looked and just can’t find a shoulder sheath/holster for my knife! View attachment 698584 Do/Can you make or point me to Stachel carry my knife. I own a basket-maker's knife with a chert blade in one of Skab's necker sheaths. It looks very authentic to the period. Skab does incredible work but I agree, this style of sheath isn't for everyone. I like his work but only for certain style of knife. Luckily, I tend toward knives that look at home in the early-mid 1800s. 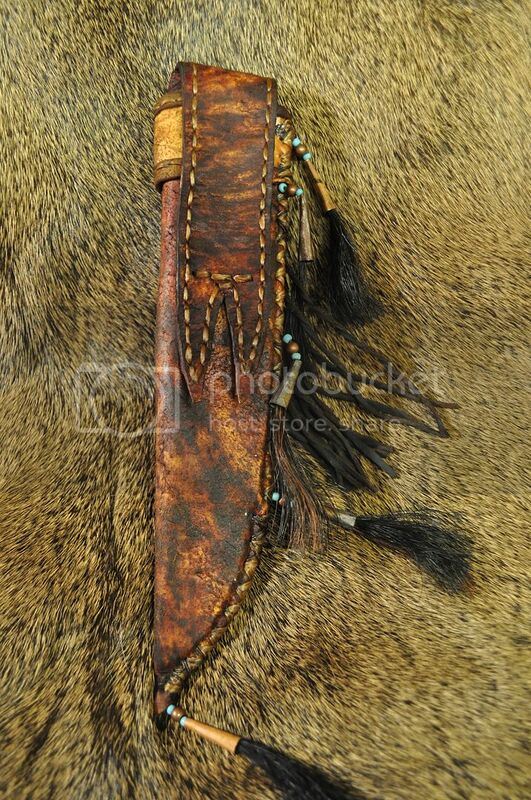 Beautiful sheath man! However I have a question if you don't mind answering, I have dabbled in leather working, have yet to do anything with rawhide, but did pick some up with the intention of trying it. My question has to do with what DomC said; too much going on I think is how he put it. How do you get everything spaced out? 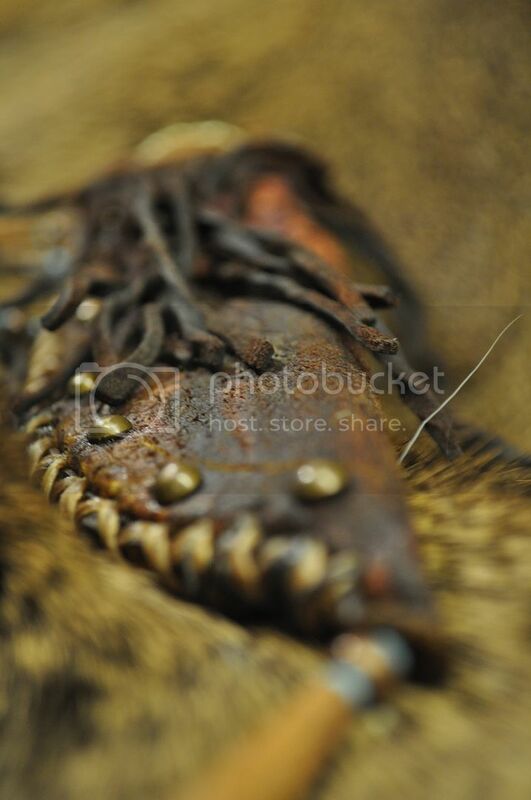 I have tried the copper cones and hair on shooting pouches, but they always seem to hit each other and make noise. Not to mention getting ripped off in the scrub oak. Maybe one day I'll get them to look as good as yours, or have to order them. Dig your style and ability to lay things out so they don't seem clustered!